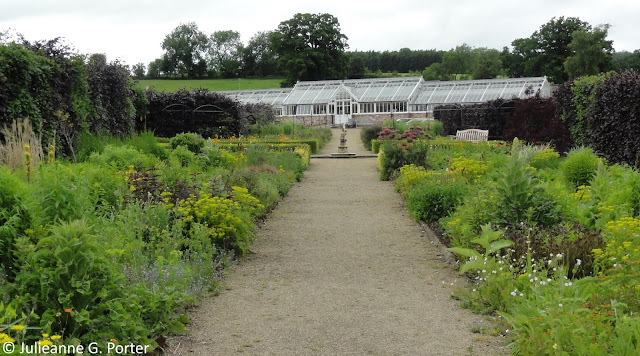 It's hard not to be attracted to the romance of a walled garden and on a recent holiday to the North York Moors I visited two, this one, Helmsley Walled Garden, and Scampston Walled Garden which will be written about separately. Helmsley Walled Garden was built in 1758 and originally provided produce to the Feversham family at nearby Duncombe Park. Between World War I and 1982 it was leased out to a commercial enterprise, but then fell into disuse. 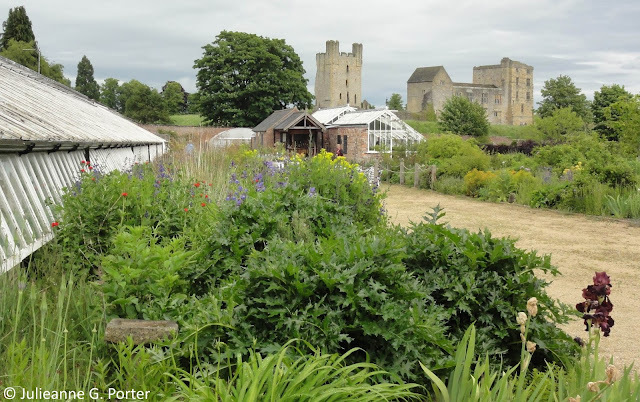 Then in 1994, Alison Ticehurst, a local woman, decided to restore the 5-acre garden to open it to all, and specifically as a place for horticultural therapy. 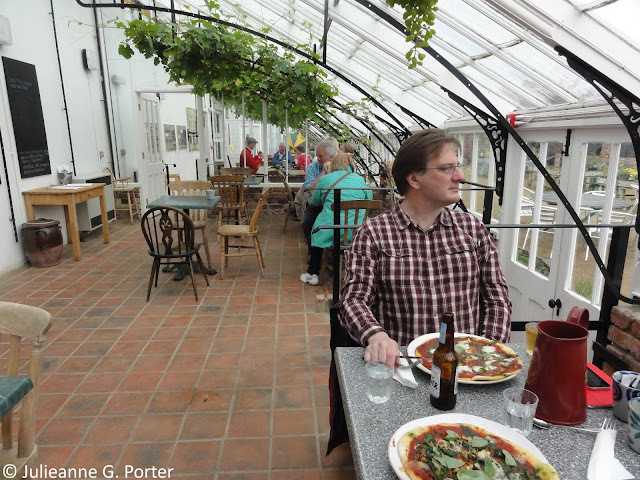 One of the old greenhouses has been turned into a separate enterprise, the Vine House Cafe, and it was here that we began our visit. As you can see below, it's a beautiful space to enjoy a meal. And the food is wonderful. We ordered pizza and expected a couple of slices heated up. Instead we got freshly made pizza's to order made with fresh produce from the garden. It was truly delicious, as was the cake we enjoyed when we returned later for afternoon tea. Just the cafe alone is worth a visit to Helmsley. Lunch enjoyed, we then ventured into the garden. Scampston and Helmsley, whilst both being walled gardens are quite different from each other. This no bad thing, quite the contrary, it would be boring to have visited to similar gardens in the space of a few days. Scampston has straight lines and distinct garden rooms, whereas there are few straight borders at Helmsley and one area of the gardens flows out of and into the next. I loved both, though for different reasons. Kevin and I were both taken with Helmsley immediately. It is very much the kind of garden I enjoy most. 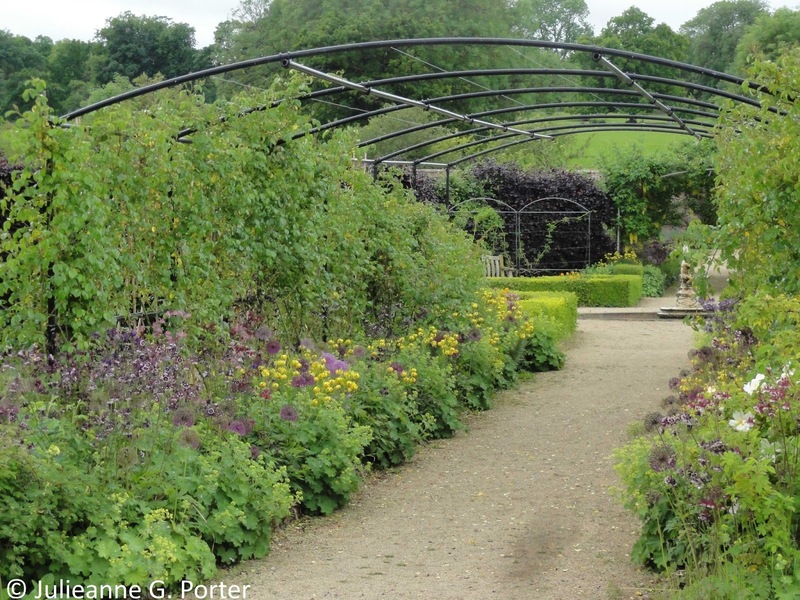 Spread over five acres, it's a mix of beautifully planted borders, meadows and vegetable gardens. 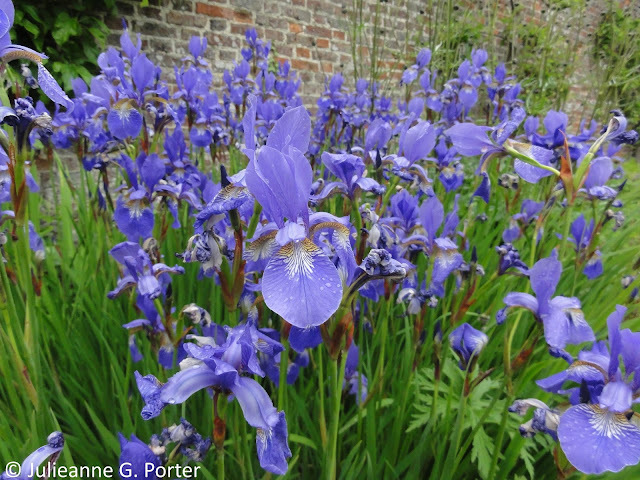 The borders have a very relaxed cottage style where plants have been allowed to spread and enjoy their surroundings. Along part of one long wall of the garden the blues and greens looked lush and gorgeous. 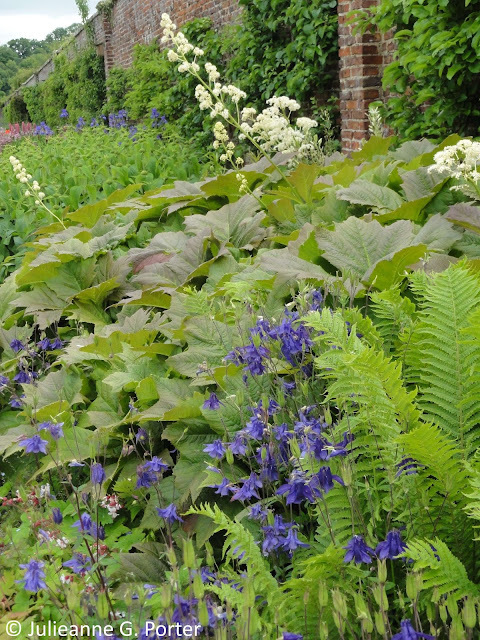 This theme, using different perennial plants, from the characterful foliage of ferns and Rheum, to the elegant blues of Aquilegias and Irises, was repeated, with fruit trees growing up the wall framing the under planting. 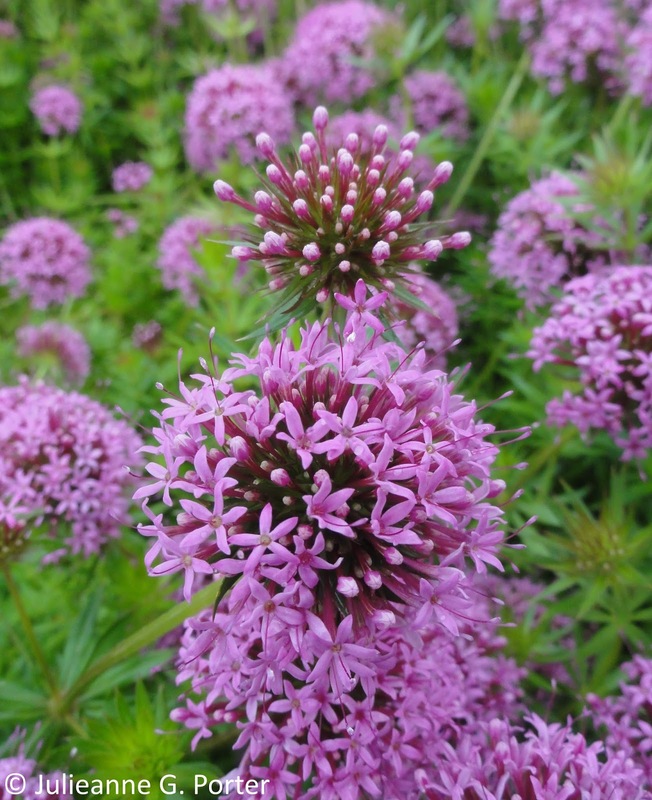 In amongst the Gravel Garden plants, I fell in love with this one which was new to me. 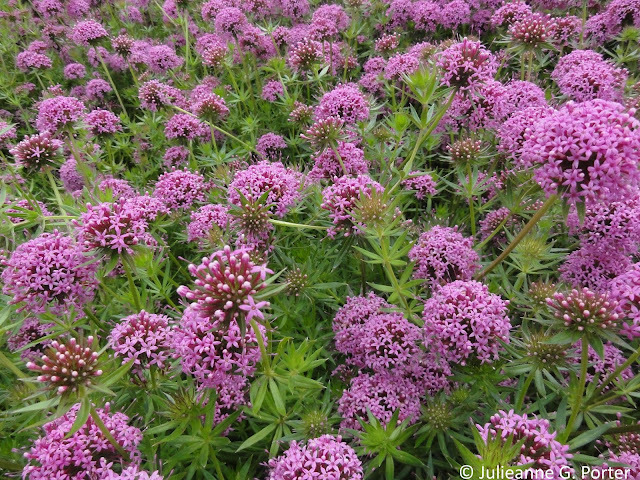 I forgot to ask the name when I was there, but Tricia, the very helpful woman who runs their Twitter account, informed me it was Phuopsis stylosa. I loved the colour. 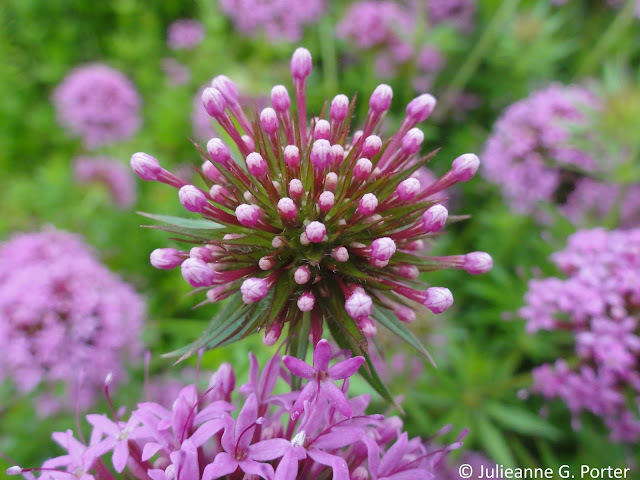 the flower, the foliage, the way it scrambled around a border. Just gorgeous and now an absolute must have. The Phuopsis was repeated in different borders. As was this beautiful blue Iris. 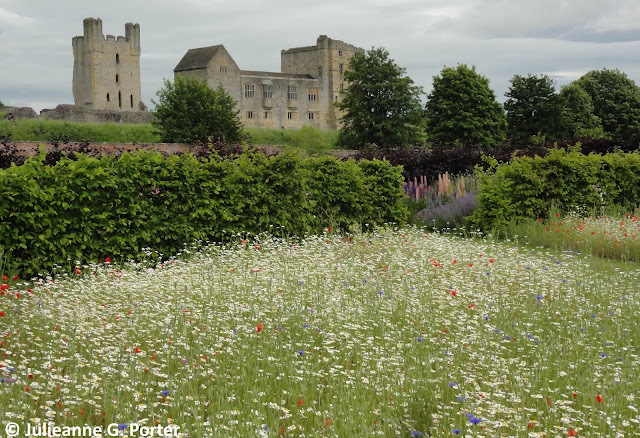 Helmsley has two meadows, an annual and a perennial one. From the annual meadow you get a great view over to the castle. 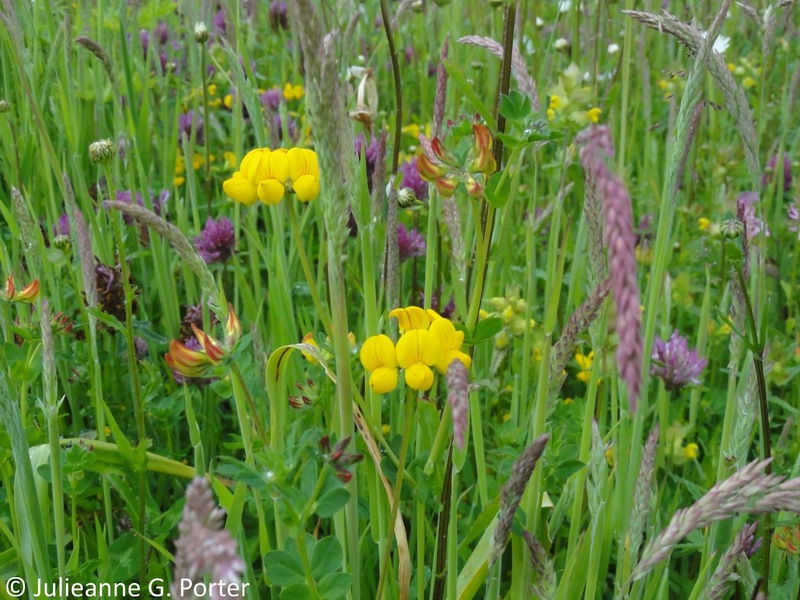 It was very pretty, but it was the Perennial Meadow that I most loved. Flowers and grasses were growing in wild abandon. 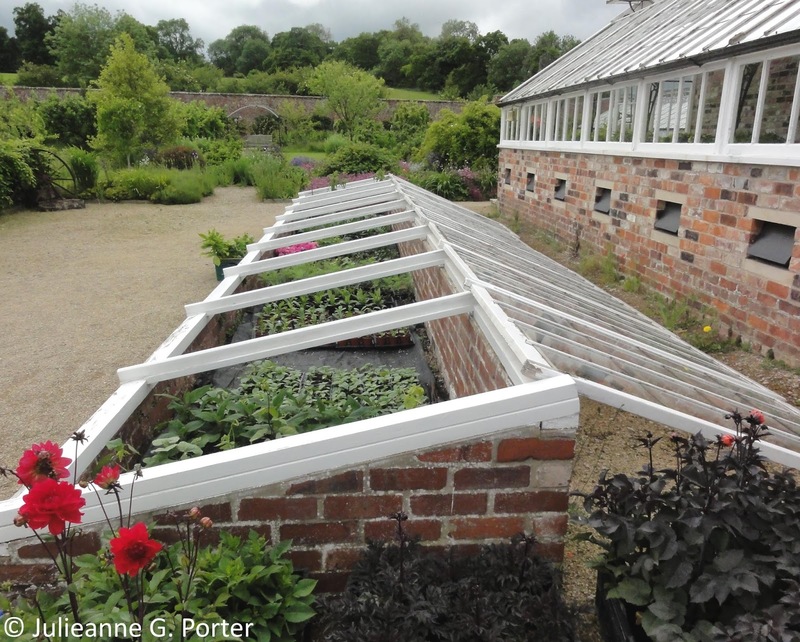 They were enchanting against the backdrop of one of the restored greenhouses. 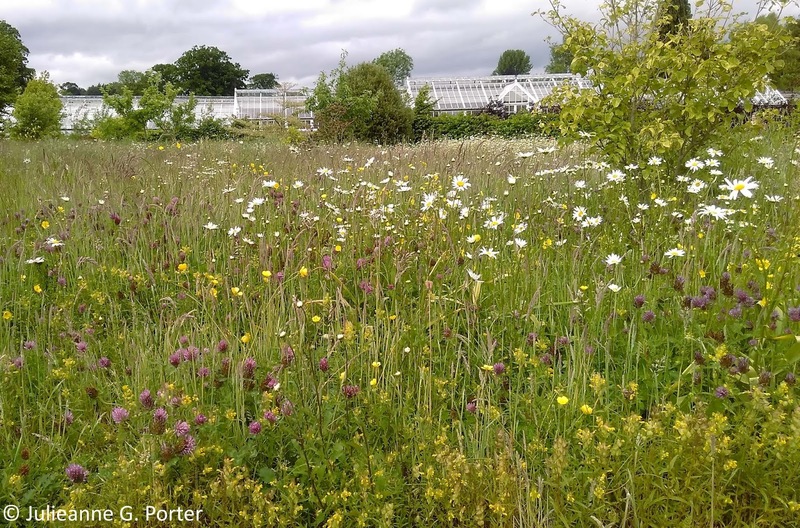 Perennial meadow detail, including yellow rattle grass which is semi-parasitic and weakens rye grass to allow other species to thrive. 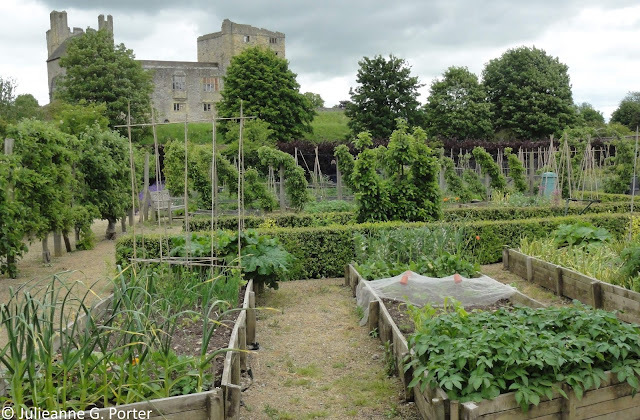 The castle looms over the garden much of the time, as it does here just on the edge of the vegetable garden. 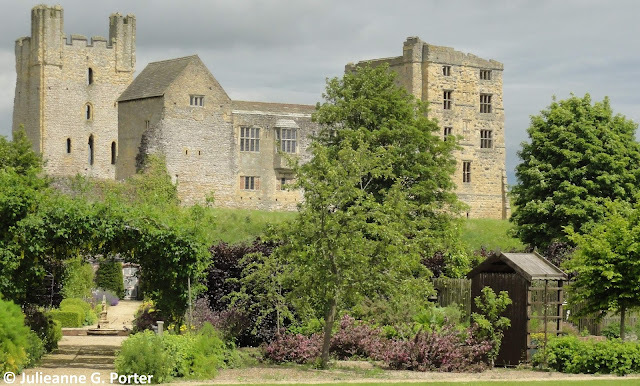 In fact it is a wonderful 'borrowed view' and gives both a dramatic backdrop to the garden and situates it within a wider context of the world beyond it's walls. The garden isn't walled in and separate from it's surroundings, it's walled within. The cafe uses seasonal produce from the kitchen garden and as you saw above, I can attest to it's extreme yumminess! I liked the allotment-feel of the vegetable garden. 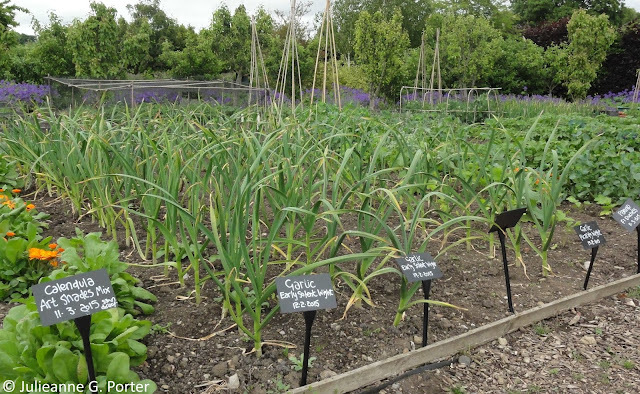 Here is the practical heart of the garden and the gardeners and Vine House Cafe chef work together to plan the specific varieties to be grown and then used in meals. Some of the plots are used by locals. I like that sense of the garden being a part of the community. 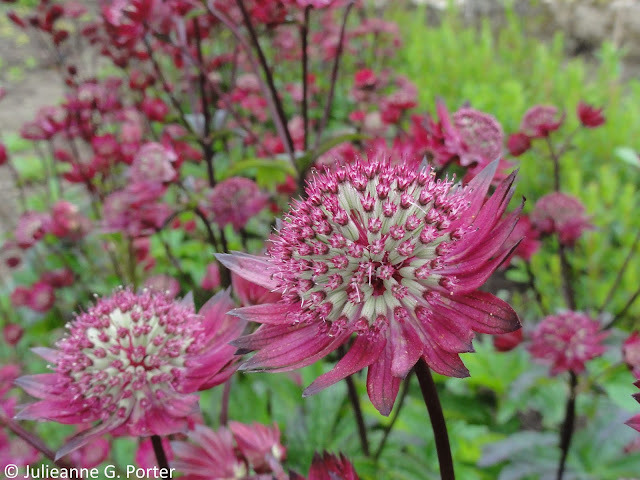 On such large site (5 acres), not everything will be in full bloom at the same time. This is the Hot Border which will really burst into life in July-August and into Autumn. It is apparently filled with reds, oranges and yellows and I hope to visit again early autumn to enjoy that spectacle. 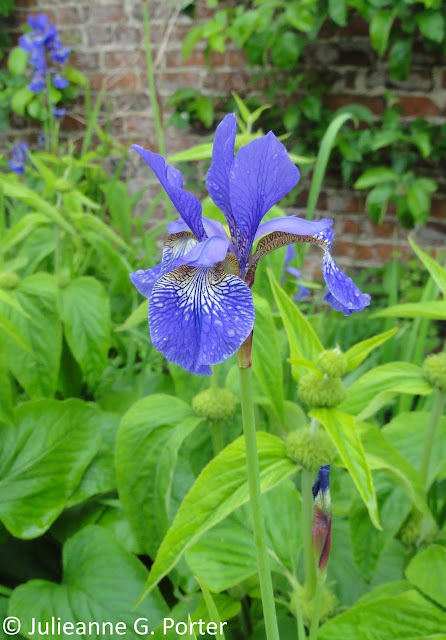 Over the hedge of the Hot Border and into the Cottage Garden, I came across another variety of blue Iris. I thought the underside of the petals, prior to blooming, looked amazing. And the full exquisite detail is realised once it unfurls. I confess I didn't notice what was climbing up this eventual tunnel as I was focused on enjoying the yellows and purples of Alchemilla mollis, Aquilegias and Alliums. And then around the next corner... Aren't these Lupins stunning? I've never been a great Lupin fan, but upon seeing these I realised that this was in part because I hadn't seen a colour combination that appealed to me prior to this. Also, single Lupins look a bit sad and out of place, but en masse like this, wow. How about a game of Where's Gwenfar? 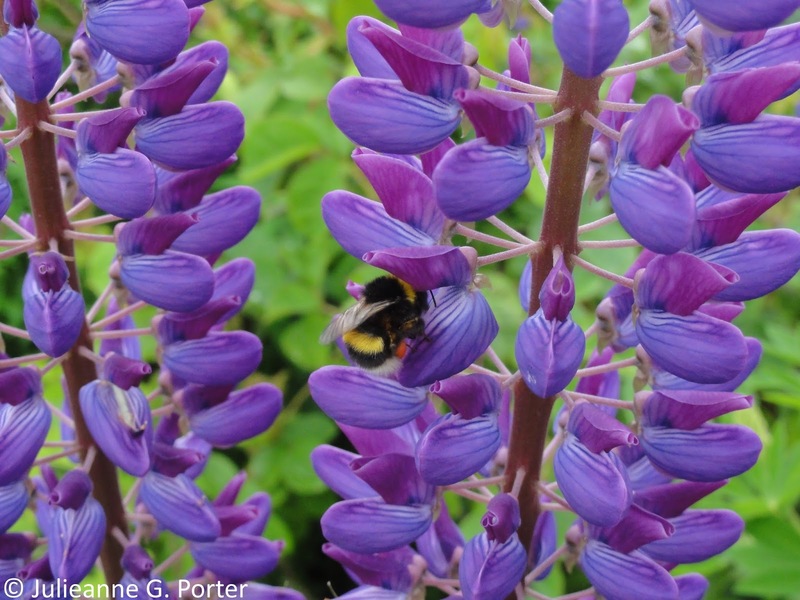 The bees liked the Lupins too. I couldn't work out where they were getting their nectar, but there were lots of bees in the Lupin patch, so they were getting it somewhere. Also well visited by bees was this Astrantia major Gill Richardson. 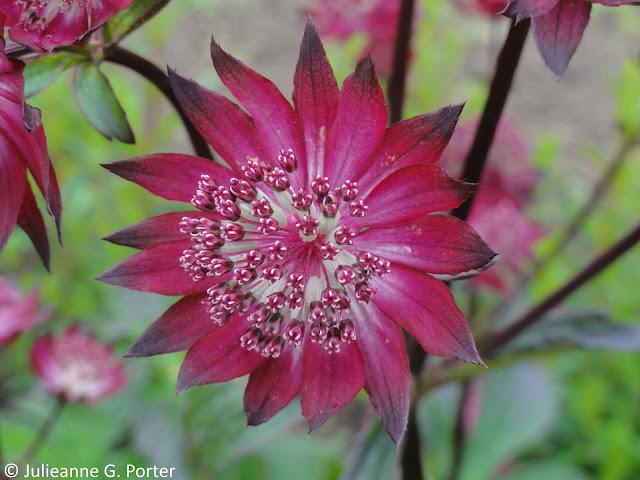 It has a similar dark colour to A. Hapsden Blood but the flower heads are larger. There was a lot to see in the garden and I confess that I didn't see it all. The garden does (thankfully) provide a lot of seating for viewing and I took frequent stops to rest my ME weary body. Annoyingly, as much as I was enjoying myself, I only had so much energy to explore. 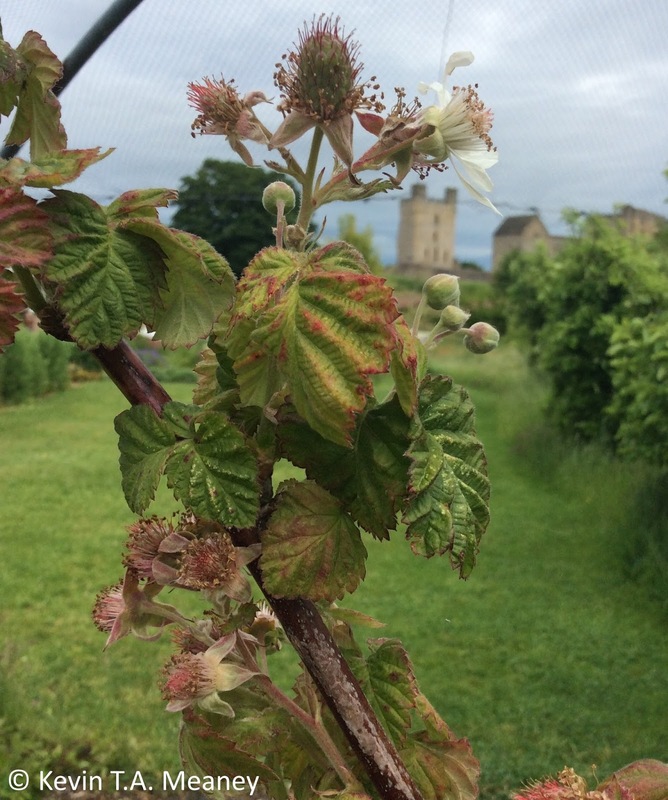 And to take artistic shots of blackberry flowers with the castle in the distance. As we headed for the exit, I drooled over these coldframes. Such dreams I have. And we laughed at the sign below, particularly about ice-cream and being nerds. I can appreciate that. 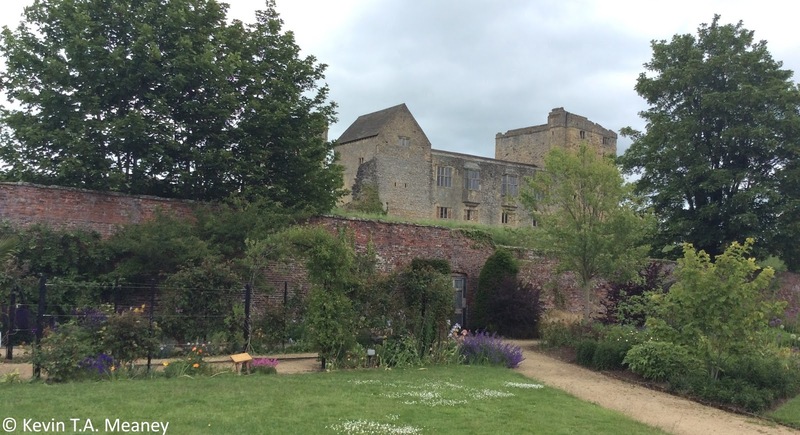 Kevin and I both loved Helmsley Walled Garden. The restoration of the garden is an ongoing project. Its development to-date has been designed with a relaxing flow within it's walls whilst borrowing from the wider context such as the castle. I love that it's also a garden that is a part of the local community. I responded emotionally to it visually and as a space working with nature. I thought the planting was relaxing and beautiful. It was a space to spend moments of contemplation, sitting amongst the flowers and listening to the birdsong and the rustling of the perennial meadow. It's my kind of garden. It's a garden I will be returning to, hopefully very soon. Did I buy any plants you ask? Well, no! The Phuopsis stylosa wasn't in stock at the time and I'm trying to reduce plant buying* as it just gives me more work. I already have enough to do whilst #GardeningWithME. 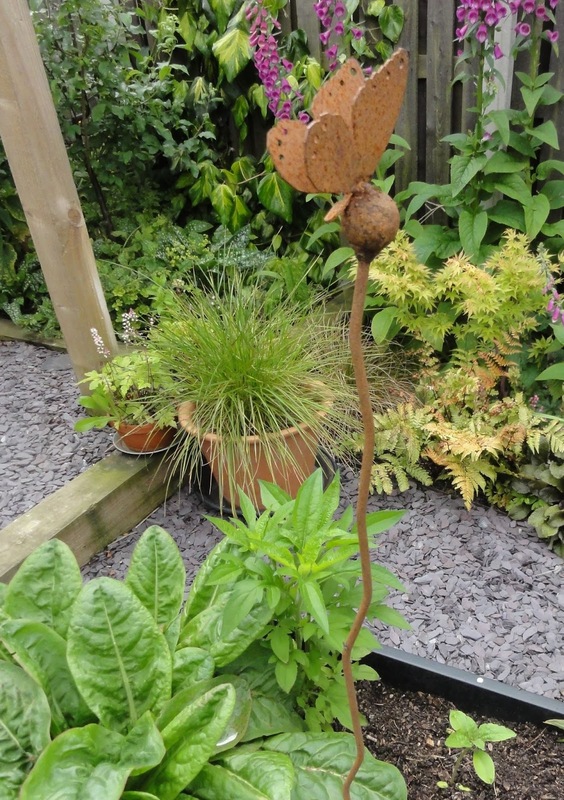 But I did buy this lovely rusted iron butterfly stake. 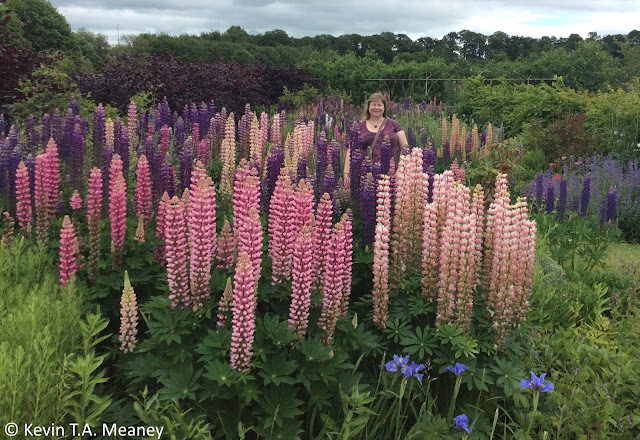 Either those lupins are huge or you are very short (as I am). It looks a stunning garden. 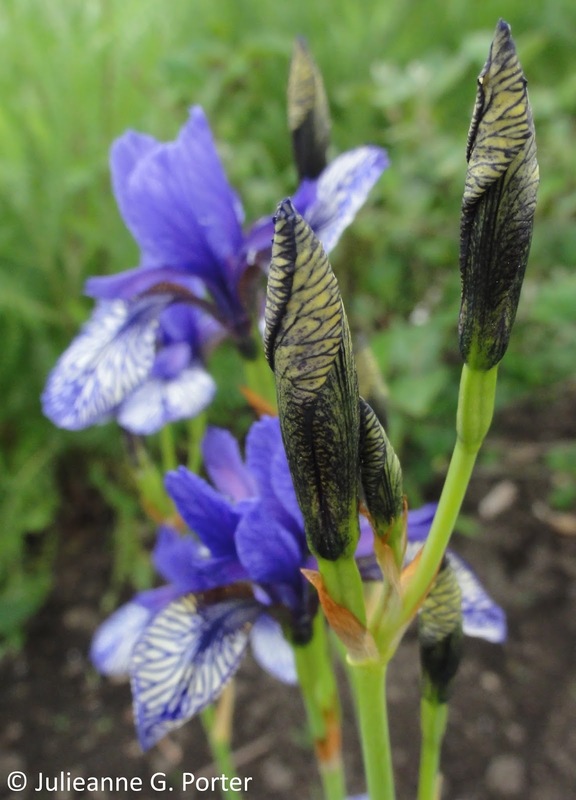 I love the irises, mine are mostly finished now. They were really tall. I am a shorty, at just under 5' 4", but they were still quite tall! Phuopsis is a lovely looking plant, but beware, I planted it once and it took over the rose garden, it took a lot of hard work to get rid of it! 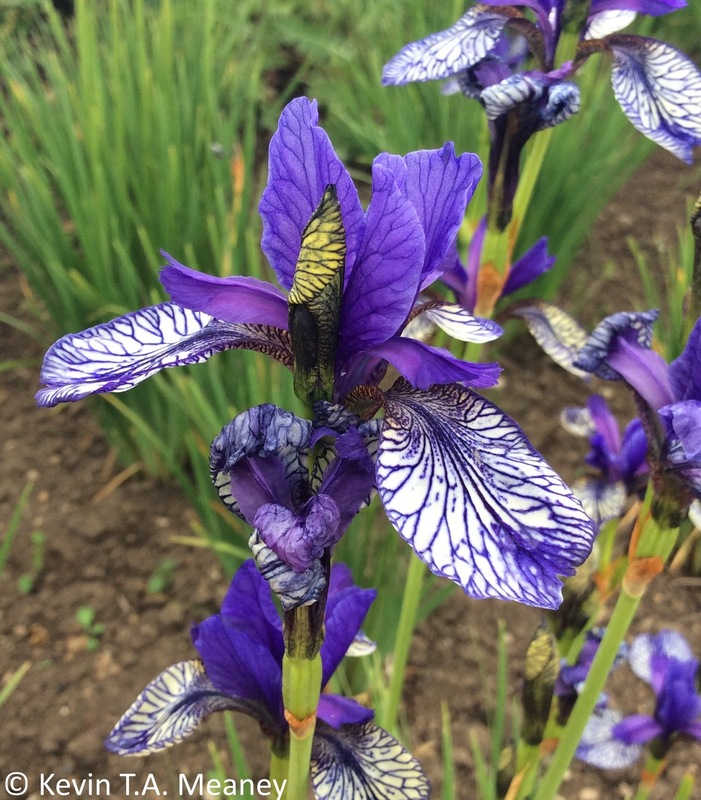 I'm so glad you were able to enjoy your garden visit, with lunch and afternoon tea too! Love your butterfly stake! Thanks for the great blog-post Julieanne, it's much appreciated. Really glad you enjoyed your day at the garden and hope you'll get the chance to come back and see how the garden develops over the season. The lupins are probably the best they've ever been this season so pleased they impressed. We are a charity providing horticultural therapy to vulnerable adults as well as a garden to visit. 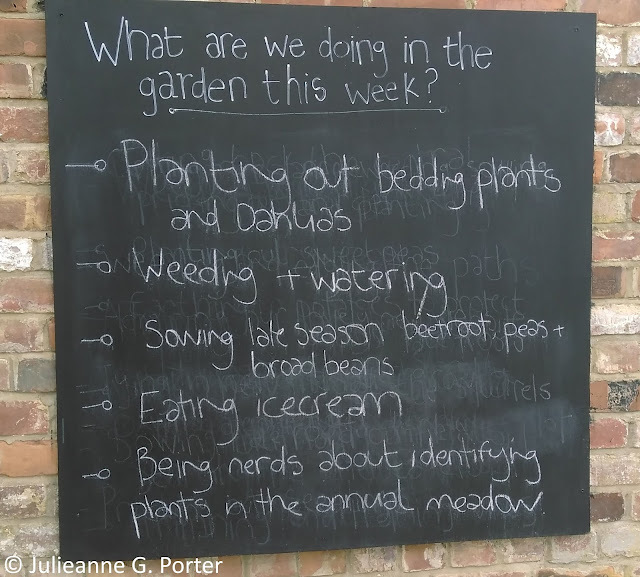 So every time you come to the garden, buy a coffee and a cake or a plant you help support the work we do so, again a very big thank you for taking the time to visit and write so beautifully about us.